There is no such thing as a maintenance free landscape. All xeric landscapes will require regular seasonal maintenance to retain their health, vigor, and attractiveness. The use of native plants and low-growing alternative turf grasses will help to lessen the maintenance load, but regular maintenance is still required. One of the most important regular maintenance items is weeding. As competition for water in the landscape increases during the warm summer months, weeds begin to gain ground by stealing water from your landscape plantings. When you are trying to conserve water, excessive weeds can become a major factor. 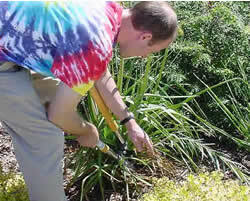 One of the best and most effective methods of weed control is to simply pull them out. If you have followed the principle of applying mulch, this task should be fairly easy. It is important to pull weeds before they set seed and create a new crop of weeds. Also, if weeds are being recycled into a compost pile, it is important to pull them before the seed becomes mature as the temperatures in compost piles are not hot enough to sterilize the seeds. If you have a large expanse of weeds to eradicate, the careful use of herbicide is much more practical. Just be sure to follow the directions on the label exactly. Mature shrubs will require periodic pruning to maintain health and vigor. Regular pruning will help prevent plants from becoming leggy, with production only in the top portion of the plant. Old overgrown stems should be pruned back close to the ground, thinning the plant out and allowing the newer vegetation to produce more leaves closer to the base. Fall and winter watering is critical to the health and vigor of landscape plantings especially under drought conditions. Unfortunately, winter watering is often overlooked. Even worse, many people believe that watering during the winter will freeze roots. This is completely false. Even though trees and shrubs appear to go dormant during the winter months, root systems will remain active until the soil temperature drops below 40 degrees. Even then, some deep roots may continue to absorb much needed moisture through the entire winter. The lack of winter moisture is one of the main dangers plants in our region face. Plants that do not receive adequate winter moisture may not leaf out well in the spring. Or, they may leaf out well but begin to exhibit stress symptoms indicated by browning leaves in early summer. The plants show stress when they do because they have leafed out using all of the stored energy in the branches, twigs and buds. Once the energy is depleted, dehydrated roots struggle to keep up. Just when the water demand within the plant increases to supply the new leaves, and the overall evapotranspiration rate climbs due to summer heat, the root system now cannot supply it. Supplemental water should be applied periodically to the landscape during dry years from October through March. Aerate lawns and mow to a height of three inches. Check sprinkler systems & clean filter. Prune evergreen shrubs. Work compost into soil. Plant new trees and shrubs. Apply new mulch as needed. schedule of pest control. Remove weeds regularly. Trim dead flower heads. Mow grass to a height of 21/2” to 3”. Check sprinkler coverage & clean filter system every four weeks. Apply lawn fertilizer. Water the landscape well in preparation for winter. Cut back spent flowers. Clean up fallen leaves and dead plant material and add to the compost pile. Blow out underground sprinkler system to prevent freezing and breaking pipes. Water root zones of plants by hand if there is no precipitation. Prune deciduous trees & shrubs.